CES Unveiled 2014 highlights | What Hi-Fi? 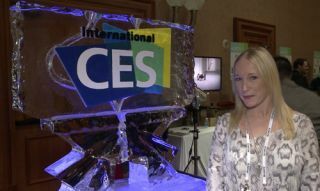 While CES Unveiled is often the stomping ground of smaller, newer companies, LG was there showing off a few new products. Firstly we got a sneak peek at its new flagship 4K TV, the UB9800. The one we saw was a huge 84in, but isn’t the biggest, with a 98in set coming too, alongside 65 and 79in versions. Also on show was the world’s first curved smartphone, the LG G Flex. Due for release in the UK in Febraury, it features a 6in, 720p curved screen, a 13MP camera and a “self healing” back panel, which will gradually repair minor scratches. LG says the curved screen makes for a more immersive experience – we’ll let you know what we think in our review. Seiki, a company known for its budget 4K TVs, was showing off its new 2014 line up, with screen sizes ranging from 28 inches all the way up to 85in. Most interesting, though, was its Seiki U-Vision HDMI cable, which will upconvert Full HD to 4K Ultra HD, helping to solve the lack of 4K content. Over at the Pure stand, the Jongo family gets some new colours, and a firmware update that will allow users of Pure’s multiroom system to play music via Bluetooth using third party apps. Until recently you could use only Pure Connect, but you’ll now be able to use the likes of Spotify, which will open up Pure's usage to really rival that of Sonos. There was no shortage of wireless speakers to be found at the show, and the most eye-catching – despite being ‘invisible’ – was the ClearView Audio Clio wireless Bluetooth speaker. It uses a 1mm thin acrylic glass panel, which resonates to create the sound, with all the electronics, the 2in woofer and the stereo dipole speakers housed in the base. Also on show was Dream Audio’s Dream One. Looking a little like a Dalek’s kettle it offers a whole load of connections including aptX Bluetooth, wi-fi, DLNA, AirPlay, USB and 3.5mm analogue – and its 360-degree design aims to eliminate the sweet spot. While you can get stereo playback from one unit, you can also connect a second unit and configure them as left and right. They’ll cost $600 each. Soundfreaq was showing off three new speakers, the smallest of which was the Pocket Kick – a $99 portable, pocketable speaker that offers a 10-hour battery life and doubles up as a speakerphone. It was also showing off the Double Spot speaker – a larger portable option, designed for use largely in the home, and the Soundrise alarm clock BT speaker hybrid. Supertooth was demonstrating its Disco 4, a super-light 8W speaker, offering 15 hours of battery life and Bluetooth connection via NFC, while Marshall went the other way, with a large 115W speaker called Woburn, modelled on the design of their iconic amps. Another big area for CES Unveiled is headphones, and there was certainly no shortage of them this year. We first took a look at YurBuds Inspire Wireless Bluetooth earphones, which feature a Twist Lock system that ensures they won’t fall out, and flexible tips that, it's claimed, won’t hurt your ears. They offer 15mm drivers, 6 hours of battery life and are sweat-resistant too, so perfect for sports. Elsewhere, Urban Ears revealed a new pair of headphones called Humlan. The covers from the band and earcups comes off and can be washed, and they’ll be available in 10 to 12 colours at launch. Finally BeeWi, a French company, was previewing a pair of new Bluetooth headphones, which feature changeable colour LEDs on the earcups. It's currently working on an app for Android and iOS that will allow you to customise this to your likening, so expect to see the finished product launching in six months or so. There's plenty more to come from CES – check out the CES 2014 schedule of events to see what's coming and when and how best to follow the new on whathifi.com.